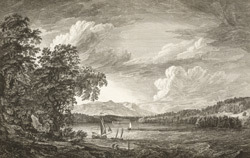 18th century view of the country near Poughkeepsie in the couty of New York with the Hudson River in the foreground and the catskill Mountains in the background. The name Poughkeepsie (soetimes Pakeepsie or Pakepsey) is derived from a native American word. The Catskill mountains are situated about 100 miles to the North West of new York city and the highest of the peaks is Slide Mountain which stands to a height of 4,180 feet. The Hudson River flows from the Adirondack mountains to New York city. It was named after Henry Hudson, an English explorer who navigated the river in 1609.